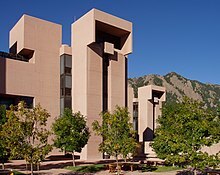 The US National Center for Atmospheric Research (NCAR /ˈɛnkɑːr/) is a US federally funded research and development center (FFRDC) managed by the nonprofit University Corporation for Atmospheric Research (UCAR) and funded by the National Science Foundation (NSF). NCAR has multiple facilities, including the I. M. Pei-designed Mesa Laboratory headquarters in Boulder, Colorado. Studies include meteorology, climate science, atmospheric chemistry, solar-terrestrial interactions, environmental and societal impacts. Notable scientists on the current staff at the center include Tom Wigley, Kevin Trenberth, and Caspar Ammann,[better source needed] and in past have included Paul Crutzen (Nobel Prize in chemistry, 1995); Paul Julian, who with colleague Roland Madden discovered the Madden–Julian oscillation; Stephen Schneider . Greg Holland initiated the multiscale modeling project "Predicting the Earth System Across Scales". Computational & Information Systems Laboratory (CISL)—CISL was formerly known as the Scientific Computing Division (SCD). CISL manages and operates NCAR's supercomputers, mass storage system, networking, and other computing and cyberinfrastructure services. The Institute for Mathematics Applied to Geosciences (IMAGe) is a research division within CISL. Earth Observing Laboratory (EOL)—EOL was formerly known as the Atmospheric Technology Division (ATD). EOL manages and operates NCAR's lower atmosphere observing systems, including ground-based instrumentation and two research aircraft, on behalf of the NSF. High Altitude Observatory (HAO)—The oldest part of NCAR, HAO is NCAR's solar-terrestrial physics laboratory. Research foci are the Sun and the Earth's upper atmosphere. HAO operates the Mauna Loa Solar Observatory (MLSO). NCAR's service to the universities and larger geosciences community is reinforced by the offerings of UCAR's community programs. NCAR is managed by the nonprofit UCAR and is one of the NSF's Federally Funded Research and Development Centers, with approximately 95% of its funding coming from the federal government. However, it is not a federal agency and its employees are not part of the federal personnel system. NCAR employs about 761 staff. Its annual expenditures in fiscal year 2015 were $167.8 million. The founding director of NCAR was Walter Orr Roberts. The current director is Everette Joseph. NCAR has many opportunities for scientific visits to the facilities for workshops, colloquia, and collaboration by colleagues in academia, government labs, and the private sector. Many NCAR staff also visit colleagues at universities and labs and serve as adjunct or visiting faculty. The Visitor Center at the Mesa Laboratory is open to the public daily at no charge. Guided tours and self-guided tablet tours include video and audio on one of the first supercomputers built by Seymour Cray as well as NCAR's modern supercomputer fleet, many hands-on educational exhibits demonstrating weather phenomena and Earth's changing climate, and a scenic outdoor weather trail. ^ a b c "New Director of the U.S. National Center for Atmospheric Research Rose Through the Ranks". July 31, 2013. ^ "CISL's NCAR Command Language (NCL)". UCAR. ^ M. Gad-el-Hak Large Scale Disasters Prediction Control and Mitigation" 2008 "was initiated by Greg Holland"